The Samsung z110 is an elegant 3G phone with a swivelling 1.0 megapixel camera, due to be released on the Vodafone 3G network in the new year. With a large 176x220 pixel main display and secondary sub-display, the Samsung z110 easy to use, and with full 3G functionality, including video calling, the z110 is lots of fun too! 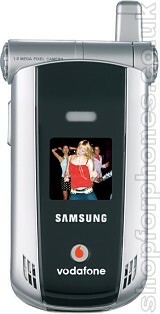 We are awaiting final confirmation of details from Samsung, but the z110 should be available by spring 2005. Please subscribe to our newsletter for updates. If you want more information on the Samsung z110, subscribe to our mailing list. Also, the Update newsletter contains general news about new phone releases.